Professor Henry Higgins would have to change his little ditty for Eliza Doolittle if he was with our Lafayette leopards today at the shore city of Valencia. 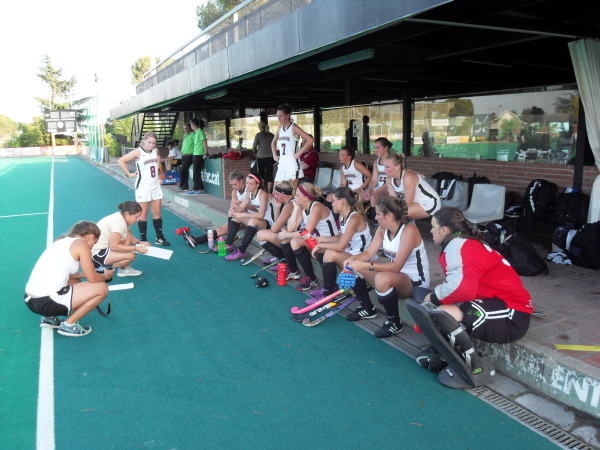 Try as they might, the game with the Valencia hockey club had to be cancelled because of thunderstorms. They tried to wait it out, but it was not going to clear up, so the two teams decided to have dinner together anyway, and as the above picture demonstrates new friends were easily acquired. The dinner became a last night celebration and the Valencia Hockey Club could not have made better dinner companions! Soon the team will trek back to Madrid to catch their plane to JFK and the Lehigh Valley. By all accounts, the trip was a great success not only for their play on the field, but also the bonding experience they had during their adventures in three outstanding Spanish cities. They got a chance to play against good european competition, watch the very best play in the World games while in Valencia, and experience a new culture. They were able to visit and see interesting venues, learned to cook with a Spanish flare, and had time to get some Mediterranean sun in the process. l can’t wait to see their new skills on the field as they apply their experiences in Spain to their NCAA division one opponents. I will be following all the action. It will include the opening of preseason camp in 60 days as well as an assessment of all the Patriot League teams. If there is any news, be sure to check here for updates. As for now, welcome back and well done ladies! !